1 - Since Italian unification in 1861, which of these cities has never at one point been capital of Italy? 2 - What was the last Republican city to fall to the Nationalist in the Spanish Civil War? 3 - Friedrich Barbarossa died in 1190, to the great relief of Saladin, while travelling through Asia Minor on crusade. On which Crusade was this? 4 - What Chinese dynasty did the Manchu minority establishes? 5 - What happened to a Dutch fleet during the Napoleonic wars? 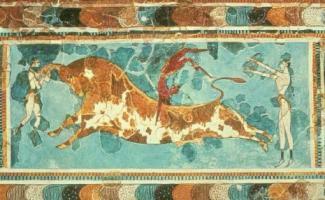 6 - Of which ancient civilization is the mural below typical? 7 - Which of the following was never part of the Britsh Empire? 8 - Which crusade founded the Latin empire in Constantinople? 9 - How did the rule of Charles V of Spain end? 10 - What did the Battle of the Plains of Abraham decide? 11 - Who is this man? 12 - Which Russian tzar was killed in his bedroom on March 11, 1801? 13 - Which of the following US Presidential elections had the closest electoral vote? 14 - The 25th Dynasty of Egypt originally ruled which foreign empire? 16 - How did the Mycenian civilisation come to an end? 17 - When was Malaysia formed? 18 - What was the capital of the Zulus under King Cetshwayo? 19 - Brazil has had 3 capitals during its history. Which are they? 20 - At what city did King Henry IV of Germany submit on his knees to the authority of Pope Gregory VII in 1073?